Google.com is one of the most popular sites on the Internet and is used around the world by millions of people every day. Sure, you know how to "Google it" when you're searching for something-anything!-on the Web. It's plenty fast and easy to use. But did you know how much more you could achieve with the world's best search engine by clicking beyond the "Google Search" button? While you can interface with Google in 97 languages and glean results in 35, you can't find any kind of instruction manual from Google. 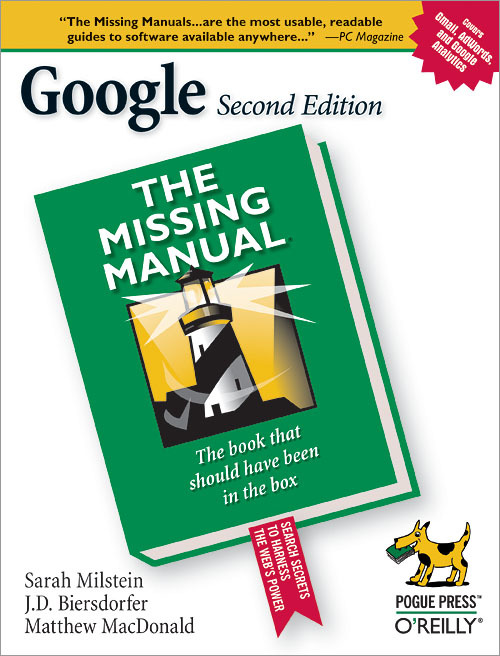 Lucky for you, our fully updated and greatly expanded second edition to the bestselling Google: The Missing Manual covers everything you could possibly want to know about Google, including the newest and coolest-and often most underused (what is Froogle, anyway?)-features. There's even a full chapter devoted to Gmail, Google's free email service that includes a whopping 2.5 GB of space). (author and editor) is O'Reilly Media's Managing Editor for Consumer Books. Previously, she was the Missing Manual series editor and a freelance business and technology reporter. She has been a regular contributor to The New York Times and a slew of other publications, most of them now defunct. When not planted at the keyboard, she likes to take epic walks, play poker, watch baseball, and rearrange the furniture. View Sarah Milstein's full profile page. (author, Chapter 11 and revisions throughout the book) is the author of iPod & iTunes: The Missing Manual and The iPod Shuffle Fan Book and sometimes even writes about things other than iPods. She does the weekly computer Q&A column for The New York Times and is equally obsessed with the BBC World News and the banjo in her spare time. View J.D. Biersdorfer's full profile page. (author, Chapters 8 and 9, previous edition) is O'Reilly Media's Chief Technology Officer. He has co-authored various O'Reilly books, including Mac OS X Hacks, Google Hacks, Essential Blogging, and Peer to Peer: Harnessing the Power of Disruptive Technologies, and he's program chair for the O'Reilly Emerging Technology Conference. Email: googlemm@raelity.org. (author, Chapter 10 and revisions in Chapter 9) is an author, educator, and programmer extraordinaire. He's the author of Excel: The Missing Manual, Creating Web Sites: The Missing Manual, and over a dozen books about .NET programming. View Matthew MacDonald's full profile page. Does Google Know You're There?